I was intrigued by all of the spiral cut vegetables I had been seeing on the Internet. Zucchini noodles are everywhere! And people seem to love using them instead of pasta. So…when I saw last week that Amazon was featuring the Paderno Tri-Blade Spiral Vegetable Slicer as one of their sale items on Prime Day I took the bait. I could have made zucchini noodles, a spiralized cucumber salad, or any number of low-carb healthy dishes. What did I make the first time I used my spiral slicer? Why, Oven Fried Curly Fries, of course! 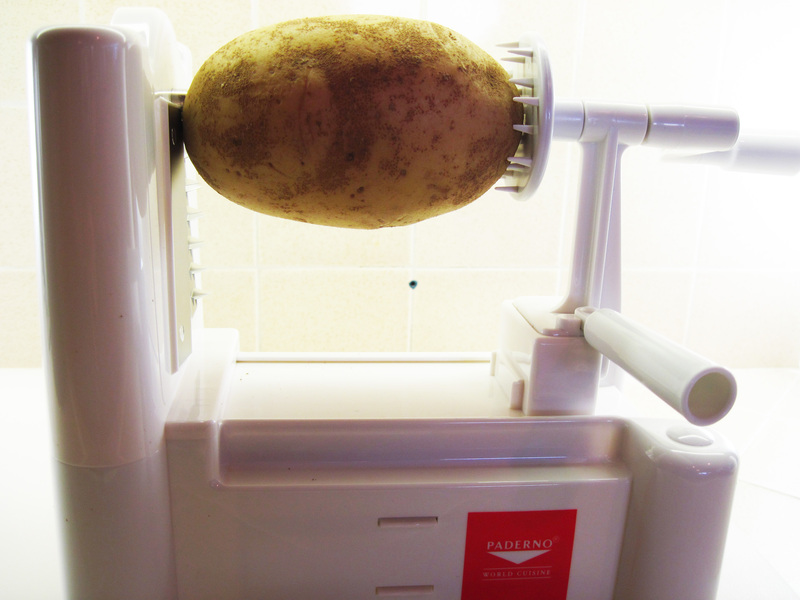 My new kitchen toy cut the potato very quickly. It feels like a solidly-built gadget that will stand the test of time. We shall see. The strips of potatoes were very long, so I cut them down to a more manageable length with a pair of kitchen scissors. 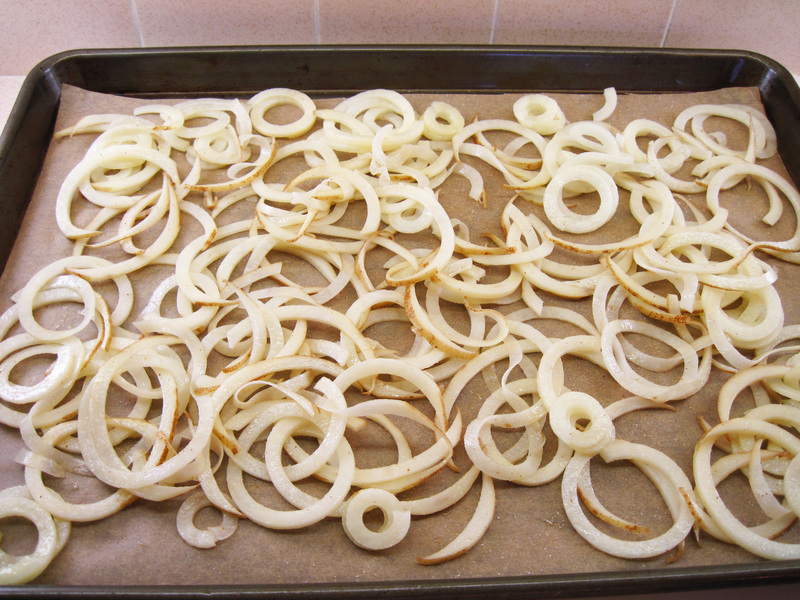 After a quick toss with olive oil and a sprinkle of salt they were ready for the oven. The Oven Fried Curly Fries were delicious and fun to eat! Bob totally approved and I know I’ll be making these fries again. 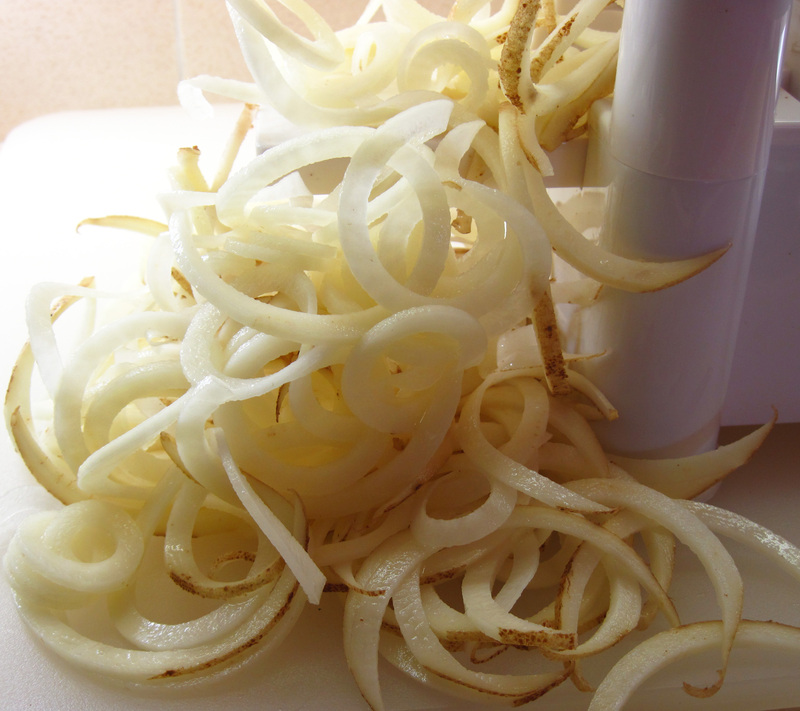 If you don’t have a spiral slicer, you could use a sharp knife to cut a potato into very thin fries and then proceed with the recipe. They won’t have the fun curly shape but they’ll still be tasty! 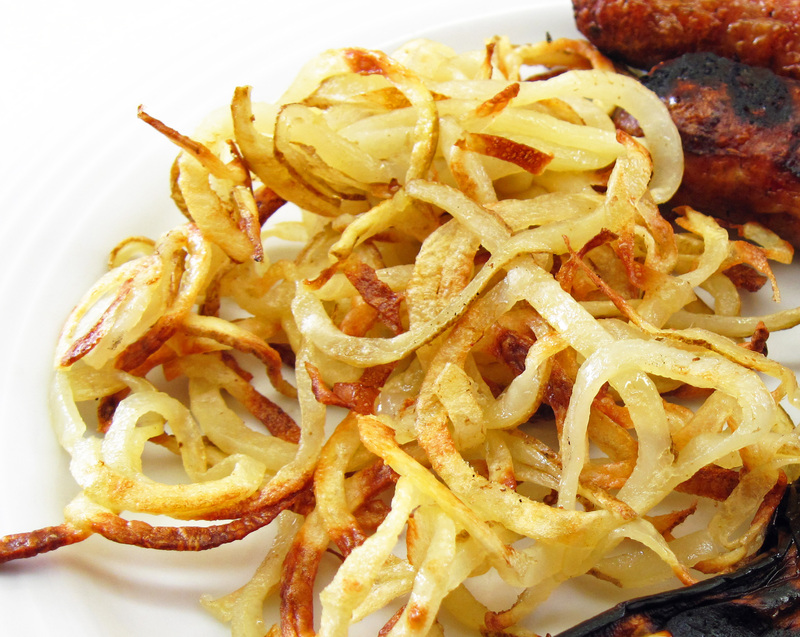 Oven Fried Curly Fries, served with grilled chicken sausage, grilled eggplant, and a salad. 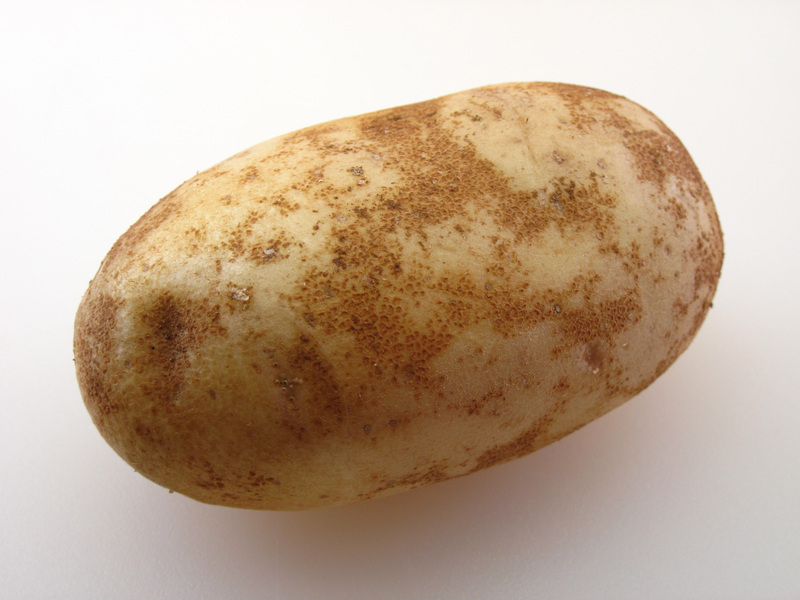 A 12.75-ounce russet potato is big enough to serve 2! 2. 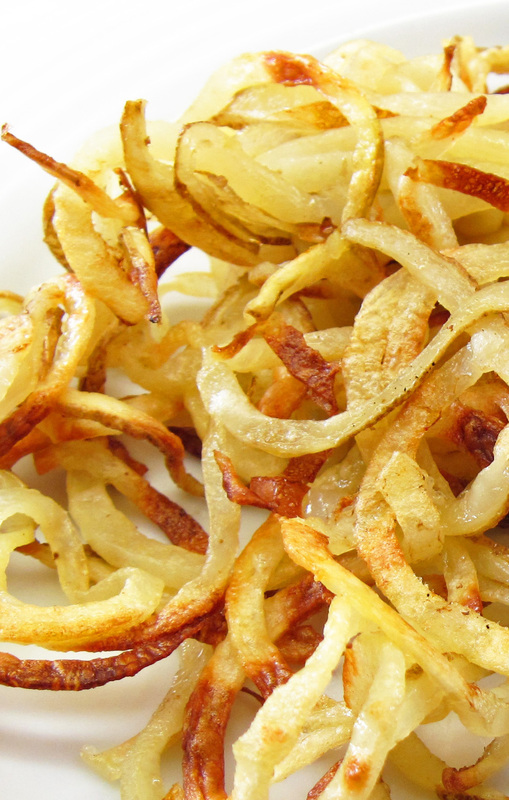 Cut the potato with a spiral slicer. Use scissors to cut the long strips into shorter lengths. 3. Put the potatoes in a bowl and toss with the oil. 5. Bake for 15 minutes. Turn the fries over with a spatula. 6. Bake for an additional 5 – 10 minutes, or until done they way you like them.